For the most innovative mini putting green flags to hit the market in over fifty years, check out the selection at PushNPutt. Our patented interactive design removes the need to bend over to retrieve your golf balls. Making it a great tool for golfers of all ages and abilities! If you’re an avid golfer, you may own a portable putting green to keep your game sharp year-round. These greens provide a great way to de-stress in the office, spend a rainy day, or perfect your putt. And for years, mini putting green flags only served the purpose of marking the cup. But not anymore! The interactive flags at Push N Putt are making it easier to keep on putting. Our patented PutterUp model features a hook at the top of the mini putting green flag. This hook perfectly accommodates your putter, allowing for easy contact. A short, swift lift from your putter pulls the bottom of the cup and raises your golf balls back onto the putting surface. No need to bend over or dig out your golf balls with your putter. 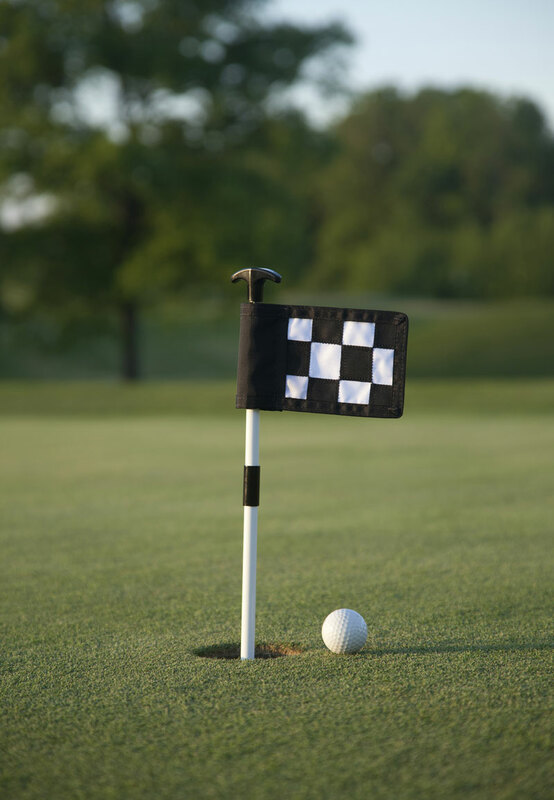 Our mini putting green flags lessen stress on your back and protect the cup from damage. In addition to our mini putting green flags, Push N Putt also offers two other models of interactive golf flagsticks. The original PushNPutt model that you simply need to push to activate. Pushing the flagstick raises the golf balls from the cup and disperses them evenly onto the putting green. Our LiftNPutt model is similar to our PutterUp mini putting green flag in that golfers need to simply lift up on the flagstick to retrieve their golf balls from the cup. All models of the PushNPutt golf flagsticks are made with superior quality materials, including 400 Denier nylon flag, powder coating and stainless steel. The flagsticks are also backed by a one-year guarantee, and they’re made in the United States at our headquarters in Newton, North Carolina. The mastermind behind our patented mini putting green flags is Jerry Mallonee. He possesses extensive experience in management including finance and cost, as well as thirty-five years in manufacturing. His idea for the PushNPutt line of golf flagsticks came to him during a game of golf with his father-in-law, who had issues retrieving his golf balls from the cup. When Jerry went over to help, he noticed that the year “1958” was stamped on the bottom of the cup. With so many innovations that had take place over the last sixty years, the mechanisms in golf had relatively stayed the same. This inspired Jerry to create a product that would solve some of the problems that had long gone unsolved in the golf industry. By creating an interactive golf flagstick, golfers of any age or ability won’t have issues retrieving their golf balls. And courses could lessen their maintenance efforts by installing these flagsticks. Golfers are less likely to dig their ball out of the cup, which damages the cup and surrounding green. When you’re ready to own your own mini putting green flag, browse the selection at PushNPutt. Our American-made products are backed by a one-year warranty and will revolutionize the way you play golf. If you have any questions, contact our team today and we’ll be happy to help!